A better understanding of tropical cyclones and hurricane hazards will help to make a more informed decision on your risk and what actions to take. Storm Surge is an abnormal rise of water generated by a storm's winds. 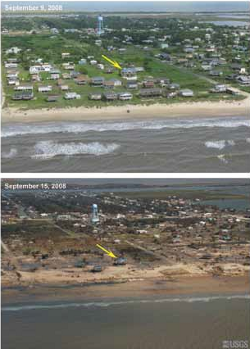 Storm surge can reach heights well over 20 feet and can span hundreds of miles of coastline. Tropical cyclones often produce widespread, torrential rains in excess of 6 inches, which may result in deadly and destructive floods. In fact, flooding is the major threat from tropical cyclones for people living inland. 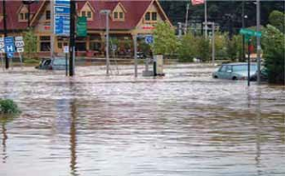 Flash flooding, defined as a rapid rise in water levels, can occur quickly due to intense rainfall. Longer term flooding on rivers and streams can persist for several days after the storm. When approaching water on a roadway, always remember Turn Around Don't Drown. Learn more about rainfall from the NWS Weather Prediction Center. 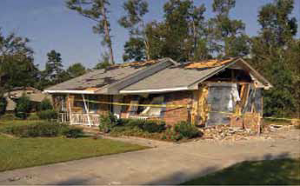 Hurricane&dash;force winds, 74 mph or more, can destroy buildings and mobile homes. Debris, such as signs, roofing material, siding and small items left outside become flying missiles during hurricanes. Winds can stay above hurricane strength well inland. In 2004, Hurricane Charley made landfall at Punta Gorda on the southwest Florida coast and produced major damage well inland across central Florida with gusts of more than 100 mph. Atlantic and Eastern Pacific hurricanes are classified into five categories according to the Saffir-Simpson Hurricane Wind Scale, which estimates potential property damage according to the hurricane's sustained wind speed. The strong winds of a tropical cyclone can cause dangerous waves that pose a significant hazard to mariners and coastal residents and visitors. When the waves break along the coast, they can produce deadly rip currents - even at large distances from the storm. Find out more about tornadoes from the NWS Storm Prediction Center.